Any further advise would be great. Speaking to sky I realized I may aswell ask my 9 month old boy to help me. Your stats are fine (apart from you being slightly capped). There's no obvious reason why your throughput is so low other than you're wireless or incorrect TCP/IP settings. However, you say you get the same wired and you've run TCPOptimizer. Just in case you've done something incorrectly, please follow these instructions carefully: run TCPoptimizer again, setting it to 8000kbps, click optimal settings, apply the changes and exit. Reboot your PC then run a wired test with this site. What speed is reported? ok, I ran the optimizer again, rebooted. do u have ur Sky TV box plugged in a socket? i know of a guy who unplugged his and it trippled his speeds!! If he's plugged into the test socket then he's disconnected any extensions so it can't be his Sky box unless he's plugged it into his test socket. In any case I'd have thought another device impacting his connection would show as a reduced sync speed/errors in his stats. There's something odd going on here. Faulty router? Is it very hot (it should be on its feet)? Do you have another you could try? Also, do you have another router cable you could try? Is your router (or the cable) next to some large electrical device such as a TV or a video sender/Dect phone? Could you check the status/drivers for your PC network card to make sure that's functioning OK? Do you have other users on the network? Do you have Sky Anytime or the BBC iplayer installed? Lastly, turn off any software you have that could impact throughput such as McAfee, other firewall, etc. Also run a virus/malware scan to see if you have some nasties sucking up your bandwidth. My router is hot but would not say overhot, its currently laying flat, not on its feet. Unfortunately I dont have another router to try. The router is in the same part of the house as my wireless telephone receiver, it has to be, its the only place where the phone line comes into the house. I know this could be the problem but would this not show up on the tests? Unfortunately, without paying bt to come and move it I have no other option with that. We also have a baby monitor running sometimes but when possible I turn that off. I have panda anti virus installed but surely I need to be running anti virus? I have another pc connecting wirelessly but during all the test I have made sure that pc is off. I dont have sky anytime on the bbc thing. I've just been playing with the setting on my router and changed the channel to level 6 and Turned UPnP On. UPnP allows devices to to advertise and offer their services to network clients (agree to open ports). 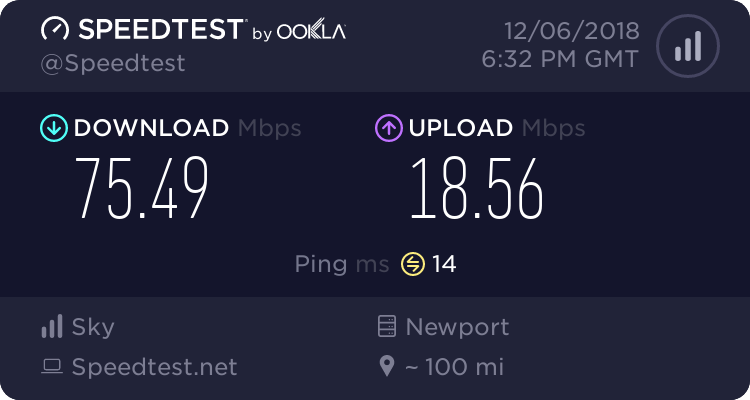 It can't make a difference to your connection speed unless you're measuring a connection such as incoming P2P. The speedtests you've tried don't need UPnP as they use the standard web interface which doesn't need ports routed. If UPnP is making a difference then there is something very odd in your PC set up. Changing the wireless channel will make a difference to the wireless connection but not wired. Yes you need antivirus. The suggestion was to temporarily disconnect it to see if it was contributing to the problem. Nearby electrical devices which give off radio frequency noise can seriously interfere with the router's operation, wireless and wired. You only responded to a couple of the suggestions. Only you can determine which of these it is. It's not possible to do this remotely. Last edited by Saturday; 04-09-07 at 09:50 AM. I had covered all the suggestions, it was getting late and I couldnt type anymore. This is really getting to me, now everytime I log into my router the channel is set at 11. When I change it to say 6 and log out, when I go back in its back on 11. And my internet and download speed is pratically 0, when last night it was the best it had been.